Renault’s Master ZE electric utility vehicle is now available for sale in Renault Trucks dealerships. The van is targeted at the urban delivery market. It has a real-world operating range of 120 km and can be fully charged in only six hours. 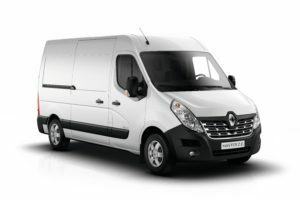 Its loading volume is the same as a conventional diesel Renault Master as the batteries are mounted under the front seats. The Master ZE is the first vehicle in a new all-electric line-up from Renault which will include a 16 tonne delivery vehicle, and a 26 tonne refuse vehicle. The Master ZE comes in six variants – four panel vans and two platform cabs – to meet the varied requirements of professionals working in urban environments. To protect both the driver and the load and guarantee the safety of city-dwellers, the Master ZE is fitted as standard with a reversing camera, a reversing radar and a wide-view mirror. The truck also features the ZE voice alert system designed to warn pedestrians that the vehicle is approaching when it is travelling at speeds of between 1 and 30 km/h.